... THATS RIGHT! Gluten free, CUPCAKE SLIDERS! How adorable. Not to mention the delicious Lactose Free Vanilla Bean Milkshake on the side is nothing to ignore either. 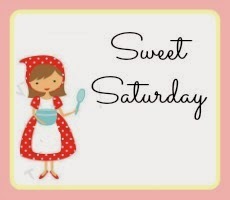 This is possibly the cutest Sweet Saturday yet. This isn't a hard recipe to bake but a harder one to assemble. You really have to work with the cupcake sliders to make them look right but I am sure you can do it. These would also be ADORBS for a birthday party. Enjoy! Make, bake and cool your normal sized Yellow Cupcakes as directed on the box recipe. Bake brownies according to directions on box and spread the batter in 15 x 10 x 1- inch pan. Bake 22-26 minutes and cool for 10 minutes. 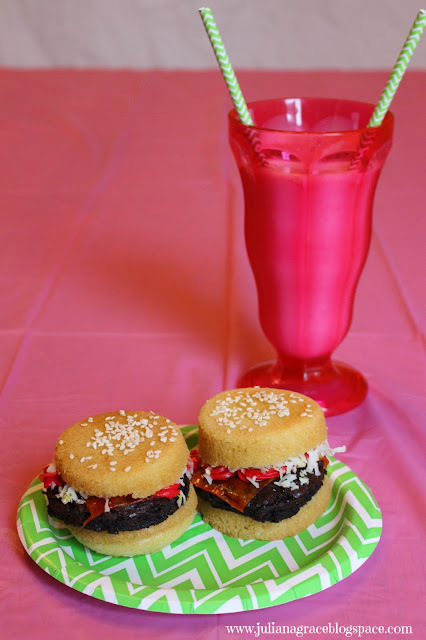 With a round cookie cutter or the top of a cup, cut 12 round for the "burger". In a medium bowl, toss coconut, green food color and 4-6 drops of water with fork until coconut reaches desired color: set aside. Remove the paper baking cups from your 12 cupcakes and cut each cupcake in half. Place a brownie (burger) on top of one of the cupcake slices with a layer of chocolate frosting to secure. To make the "cheese slices", cut a fruit roll-up into a small square and place on top of the brownie. Then top with your coconut "lettuce" and squirt red frosting on top as "ketchup". Place the second half of your cupcake "bun" on top. Sprinkle with a few sesame seeds and you are done! Using a blender combine ingredients and enjoy with your friends and family! I hope y'all enjoyed this Sweet Saturday as much as I did making it! If you try this recipe out, let me know in the comments or in an email. Talk to you soon! Made my night :) Thank you for such encouraging words. I really appreciate it! Aw, thank you :) That is always good to hear! I am glad you liked them!